It's been no secret here that I am completely in awe of Susannah Conway and having taken part in one of her E-course's this is even more true. 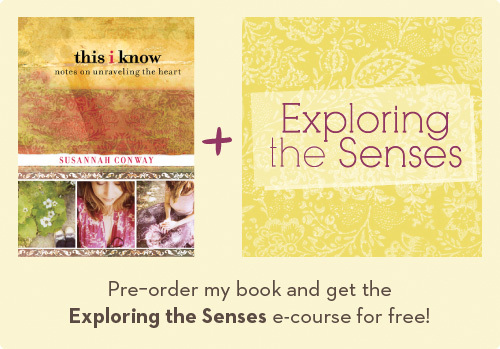 Pre-order This I Know and get a free E-Course by Susannah for free. FREE!! and then did a little dance. "The goal of Exploring the Senses is the renewal of our senses – becoming more aware of them, how we use them and how we can strengthen them. It’s so easy to jog through life with our eyes shut, our ears closed, our sense of smell dialled down to zero, so we’re going to be gently challenging this as we work through the course. This I Know is all about mindfulness, living in the present moment and mining our lives to uncover the truth about the past and our dream." I can not wait to start!! I can promise that you won't regret it. Note. This special pre-order offer will close at midnight GMT on Monday June 4th 2012.